Last Sunday, I was having a walk around the city centre of Cambridge when I saw a demonstration of around 50 people rallying for their right to vote in a referendum for independence from Spain. They were joining other demonstrations of Catalan separatists that took place all around Europe and in Spain on that same day. The Catalan government and a separatist majority in the regional parliament seek to organise a referendum on October 1st in order to decide whether Catalonia will become a republic independent from the rest of Spain. Non-separatists political parties oppose or criticize the referendum because they consider that it has been imposed unilaterally to half of the Catalan population that wishes to remain in Spain. To be sure, the Spanish constitutional court declared the referendum illegal last week and the Spanish state police raided regional government offices as well as the homes of the Catalan separatists suspected of coordinating the referendum, arrested 14 senior Catalan officials, and seized the ballot boxes, papers and other electoral material. What is more, the regional finances are now being controlled by the national finance ministry in Madrid as a way to ensure that public money is not spent on the referendum campaign. Simultaneously, the Catalan police force – the Mossos d’Esquadra – has been temporarily placed under a chain of command that reports directly to the Spanish interior ministry. The Catalan government has accused the national government of creating a situation that equals a de facto state of emergency. It is indeed difficult to determine whether in the efforts to prevent the referendum from happening, the national governments’ actions constitute or not a proportional response that is still respectful of rights such as freedom of expression or freedom of assembly. It looks like none of the parties is ready to seat on the negotiations table and none of the solutions proposed here and here and here seem to be acceptable. Today, the conflict looks to be more stuck than ever and the deadlock impossible to break. The pro-independence Catalan regional government has declared that it will not comply with the constitutional court ruling and that the referendum will take place. The conflict is rapidly escalating not only between the central government and the Catalan region, but also between pro-remainers and pro-exiters in Catalonia. This could not only have a spill over effect into other pro-independence regions, such as the Basque Country, but is also strengthening far-right nationalist sentiments in Spain and bringing back the ghosts from a not so distant past. If this is not result of lack of solutions and proposals, then what is it of? Two coined terms could be used to explain what is currently happening in Spain: Groupthink and strategic essentialism. Irving Janis popularised the concept of groupthink in the 1970’s. He defined the term “as a quick and easy way to refer to the mode of thinking that persons engage in when concurrence-seeking becomes so dominant in a cohesive ingroup that it tends to override realistic appraisal of alternative courses of action.” Groupthink is imposing itself in Spain, mainly attached to political parties for or against independence, and generating dynamics that prevent dialogue and negotiation, dehumanise the other, the “outgroup”, and vilifies it. Groupthink exaggerates the facts and the distances that separate the groups, generating the feeling that ideological, cultural, social and other differences are bigger than they objectively are. What is more, consensual points and shared values and beliefs are ignored, making it impossible to reach an agreement. As Janis himself put it: The more amiability and esprit de corps there is among the members of a policy-making ingroup, the greater the danger that independent critical thinking will be replaced by groupthink, which is likely to result in irrational and dehumanizing actions directed against outgroups. For instance, those against independence reject reaching any kind of political agreement with separatists and criticize those who try to reach consensus, and this also at local levels, such as in City Council meetings. That is, the desire for harmony in the group results in irrational decision-making outcome. But the problem is not only the division in two camps of the irreconcilable Us versus the Other, the ingroup and the outgroup, the “you are with me or you are against me”. The issue is that for this division to be effective, differences within a camp are strategically suppressed or underestimated. This is what Spivak called the “strategic essentialism” of identity and differentiation with a scrupulously visible political interest. In other words, members of a camp engage in a process of homogenization of their public image, as a way to project a common identity in order to reach certain political aims. For example, one might believe that there are no differences amongst the Catalan separatists and that they all propose the same analysis of the problem and a single solution to it: carrying out what is an illegal referendum. Or that all Catalans that are against independence are prepared to negotiate with separatists or to the contrary, that they will all boycott any referendum in the near future. To make matters worse, those part of a group end up believing that it will be easy to reach an agreement with those people who belong to their group, because they are rational and cultivated individuals. It is impossible to reach a decision with members of other groups because the concessions one would have to make would be far too important. This type of thinking surely prevents the ability to have empathy in an effort to understand the other group’s position. These two phenomena together, groupthink and strategic essentialisms, is what I called a cultivation of the politics of difference, and it can only result in polarisation of society and radicalisation of the two main groups. Testimony of this are the conversations overheard in bars or in other public spaces lately, charged with a vicious and reactionary language that conveys an authoritarian ideology of a longing past. For example, “The central state needs to take powers back” or “the shared competences system has gone too far”, or “we need to show who is in charge”. Spain and Spaniards are proud of the fact that contrary to what has happened lately in France, The Netherlands, Belgium, the UK and now Germany, the country hasn’t seen the rise of a far-right party. This source of pride might not last for long. Indeed, one of the unintended consequences of playing the politics of difference and letting the situation deteriorate to this point could be the rise of a far-right party that tries to go backwards and undo part of the walk of Spanish democracy since the late 1970’s. The central government of Mr. Rajoy and the Catalonian government of Mr. Puigdemont could both regret this equally. And very much. 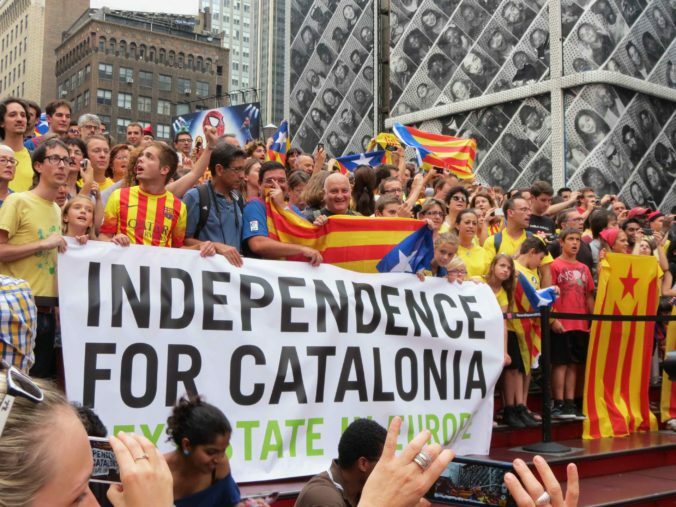 If I’m not mistaken, there was a Catalonian independence referendum in late 2009, but turnout was low and the ‘yes’ vote was purely symbolic. I gather that this time the referendum’s result would be more than symbolic, otherwise it wouldn’t have been ruled illegal and things wouldn’t have gotten to the point described in the post.